Ohio Governor Mike DeWine speaks during a public inauguration ceremony at the Ohio Statehouse, Monday, Jan. 14, 2019, in Columbus. Now known as the “Human Rights Protection Act,” SB 23 outlaws abortions at the point a fetal heartbeat can be detected. That bans the practice as early as five or six weeks into a pregnancy, before many women know they’re pregnant. "The essential function of government is to protect the most vulnerable among us, those who don't have a voice," DeWine said as he signed the bill. "Government's role should be to protect life from the beginning to the end." Ohio is the sixth state to institute a version of the “Heartbeat Bill.” Federal judges in several other states have blocked the laws or struck them down as unconstitutional. Another bill in Georgia has yet to be signed by the governor. DeWine's signature will set off a lengthy legal fight. The ACLU of Ohio announced it would sue to stop the law, which the group says "virtually bans all abortion care." “This legislation is blatantly unconstitutional and we will fight to the bitter end to ensure that this bill is permanently blocked," said ACLU of Ohio legal director Freda Levenson in a statement. The group plans to sue on behalf of Pre-Term Cleveland, Planned Parenthood of Greater Ohio, Planned Parenthood of Southwest Ohio, and the Women's Med Center of Dayton. But DeWine and lawmakers said they aren't dissuaded by the threat of legal action. Since taking office in January, DeWine said he planned to sign whichever version of the "Heartbeat Bill" ended up on his desk. "Will there be a lawsuit? Yeah, we are counting on it," said state Rep. Ron Hood (R-Ashville) on Wednesday. "We're counting on it. We're excited about it." Anti-abortion groups such as Ohio Right To Life say they intend the “Heartbeat Bill” to trigger a U.S. Supreme Court case striking down the 1973 “Roe v. Wade” decision. That case legalized abortion up until viability, usually at 22-24 weeks. "If this is what it takes, we will see you at the Supreme Court," said Planned Parenthood of Ohio president Iris Harvey at a rally Wednesday outside the Statehouse. The Ohio Senate originally passed the "Heartbeat Bill" last month. The Republican-led House Health Committee then made several changes to the bill before sending it to the House floor, where it passed by party-line vote. 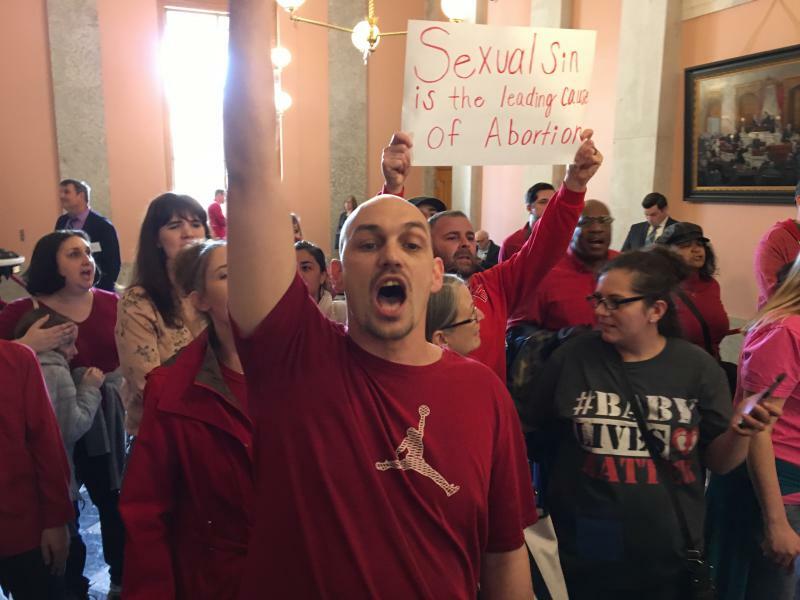 Beyond changing the official name to the “Human Rights Protection Act,” the Ohio House version protects the use of a trans-vaginal ultrasound to determine a fetal heartbeat. Such devices allow heartbeats to be detected even earlier in a pregnancy. The bill institutes criminal penalties for doctors who violate the law. Doctors who perform abortions after detecting a heartbeat would face a fifth-degree felony and up to a year in prison. The legislation also allows the State Medical Board to take disciplinary actions against doctors found in violation and impose penalties of up to $20,000. "Pro-life Ohio thanks Governor DeWine for taking a courageous stand on behalf of unborn children with beating hearts," said Ohio Right to Life president Mike Gonidakis in a statement. Currently, Ohio prohibits abortions after 20 weeks of pregnancy, and lawmakers in 2018 passed a law banning the “dilation and evacuation” method of abortion used most commonly after 12 weeks of pregnancy. The latter was blocked from taking effect by a federal judge in March. The Ohio Senate in March passed another bill requiring the burial or cremation of fetal remains. The bill is now being considered in the Ohio House. Legislators attempted several times before to pass the "Heartbeat Bill," but the legislation was twice vetoed by former Gov. John Kasich, who warned it would prove costly for the state to defend in court.